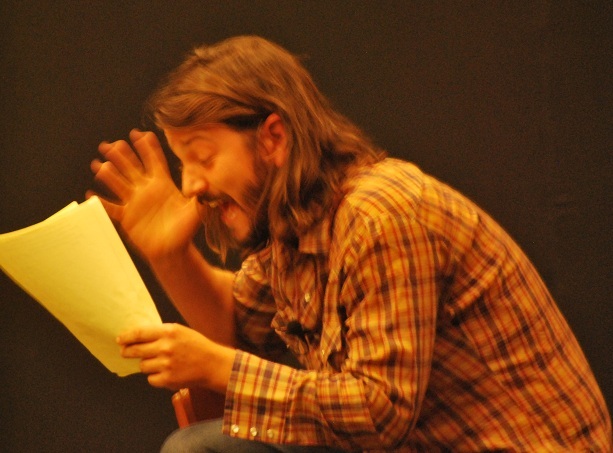 Diego Luna reads Howl en espanol! The moon is full on a cold New York night. Nights such as these are well remembered walking through Greenwich Village remembering Jack Kerouac and the Beat Generation. But on a full moon thoughts would invariably sway to Allen Ginsberg and his seminal classic — Howl. But this isn't New York City. This is Guadalajara, Mexico and the hall at the Expo Center is teeming with 500 young women who have waited in line for hours to hear Allen Ginsberg's Howl in espanol. I stand corrected. The senoritas are here to see Diego Luna. The fact that Luna is reading Howl in Spanish is either inconsequential or unknown. Diego Luna is in the house. This isn't the Vanguard in the Village, This isn't the Six Gallery in San Francisco in 1955. This is the FIL in 2012. The Guadalajara International Book Fair is the largest book fair in all of Latin America and the young women are patient and perfumed. The set wall is approximately 15X30 — all in black, except for the top left corner where a faux Madison Avenue street sign is fastened inexplicably to what appears to be the grill of an apartment sized air conditioner unit. There is a ping pong table center stage rear. Stage left has a wooden chair in front of a small table covered in black cloth. Atop that sits an old typewriter (a Burroughs perhaps?) with a single sheet of yellow paper in its carriage. Stage right has two mike stands — one for voice and one for guitar. Though there is no guitar in sight. Jaime López one of Mexico's early rock and roll rebels will be sharing the stage with Diego Luna and a guitar is expected. Behind the mike stands sits a matching wooden chair from stage left with a well worn black leather jacket draped over it. Beside the chair is a knee-high white cube with the Stars and Stripes folded neatly on top. A pair of black leather shoes are propped against the legs of the vocal mike stand. This reviewer is pumped to see Howl read in Spanish. The digital camera is at the ready so is the flip video. There are no Beatniks in Guadalajara. At least not on this night. An announcement looms. Is the show about to start? Are the lights dimming? The announcement in Spanish advises that no pictures or video are allowed except by a accredited media. More props appear on the stage — a guitar stage right and a bottle stage left. The lights are still up as are the more than 100 accredited media who are massed in the first five rows of the hall. More announcements and warnings come from the stage. The crowd erupts in applause as fuzztone guitar drills into our skulls. There is still no one on stage and the house lights are still on. Diego Luna has been described as Mexico's Brad Pitt but with this foray into Ginsberg perhaps James Franco is a better comparison. Luna bounds onto the stage wearing faded jeans with a bandana tucked into his back pocket. He sports a brown lumberjack shirt that is not tucked in. Unkempt long hair and bearded he begins to play ping pong with a balding guy wearing a green wife beater to showcase his tattooed arm — this is Jaime López. The tape of López' guitar continues in the background, blending blues guitar with a hard rock back-beat. The game momentarily stops as Luna tells us why we are here before he returns to his game of ping pong with López. The music has stopped and only the sound of a ping pong ball being paddled back and forth is heard throughout the hall. Eerie. The game ends and Luna goes over to the typewriter. He pulls out the sheet of paper and begins to read as López takes up the guitar and begins to sing from his chair stage right. Luna crumples his sheet and tosses it onto the stage before walking back to the typewriter stage left. until Luna begins to read Part I of Howl. I follow along on my iPhone — having found Ginsberg's text online. Howl is being performed in Spanish and I am reading subtitles. At least 90 percent of the audience is listening to Howl for the very first time. Had they read it previously they would have been taken aback by the pacing. Our first interlude takes place not at the end of Part I where you would reasonably expect it to occur but where we stumble at the unemployment office. Part II was read with a frenetic pacing led by López' guitar and his guttural moans of Moloch before concluding with another song by López. They segue into Part III and I'm with them in Rockland! Luna walks off stage right and López — with the stage to himself — drapes the American flag over him, dons a beret and begins blowing a mean blues harp. Luna reappears at the back of the hall wearing his bandana across his head and we ride on to Rockland and the end of Howl Parts one, two and three. We ride out with another song and Luna walks in character, brooding while walking through the crowd. The stage is littered with crumpled pieces of paper. No! The Footnote to Howl follows. López plays an imaginary game of ping pong onstage with an imaginary opponent. Luna by now at the back of the hall begins screaming Santos! repeatedly — Holy! Holy! — as he walks back to the stage. The play is over. The crowd rises with a deafening round of applause. The lights never did go down. Luna briefly explains that this is the fourth time that he and López had performed Howl in Spanish. He jokes that afterwards everyone rushes out to look for the book Aullido by Sixto Piso — the name of the Spanish language publisher of Howl in Mexico. I got what I came for — an experience. To hear Howl in Spanish is a treat. Curiously at no time before, during or after the show was Allen Ginsberg credited or even mentioned as the author of Howl. While the press release mentions Ginsberg, he should have been mentioned at least once during the evening. Damn. I want to hear this! Thanks for dropping by and introducing us to your Ginsberg blog. Cheers!